688,000 acres are burned and 10 are dead in California's summer wildfire "siege," officials say. LOS ANGELES — Officials expressed hope Saturday that the worst of the California wildfires is behind them after what's being described as a deadly summer "siege." In late July, as many as 14 fires, some out of control, raged from the Mexican to Oregon borders as a third record-setting heat wave approached in early August. Ten people were killed and 2,000 structures destroyed. In all, 688,000 acres have burned. President Trump declared a state of emergency July 25 for the Golden State. The California Department of Forestry and Fire Protection (Cal Fire) said in a statement Saturday that 12 large fires remained as "temperatures across the state are expected to cool slightly. "We are making good strides in containment on a lot of those large fires," said Cal Fire Battalion Chief Jonathan Cox. "The tide is turning." The Carr Fire in Northern California's Shasta County has claimed eight lives and destroyed 1,077 structures as it roared through the Redding, California, area late last month. The 186,416-acre blaze was 55 percent contained Saturday, according to Cal Fire. Southern California's Holy Fire has consumed 21,473 acres and 12 structures in Orange and Riverside counties. It was 29 percent contained Saturday as evacuations for many affected communities were lifted, according to Cal Fire. The National Weather Service (NWS) in San Diego forecast a slight cool-down for the area with temperatures in Riverside County expected to dip into the mid- to low 90s by the beginning of the week. "By no means do we have a major, life and structure threat in one place like we saw in Redding and Orange County," Cox said. The most widespread of what Cal Fire officials are calling a summer "siege" of blazes is Northern California's Mendocino Complex Fire, the largest wildfire recorded in state history at 325,226 acres. It was 67 percent contained Saturday. Brad Charboneau, meteorologist for the NWS in Eureka, California, said that area also would experience a slight cool-down in coming days with temperatures in the 90s instead of the 100s, which they were during the blaze's peak. 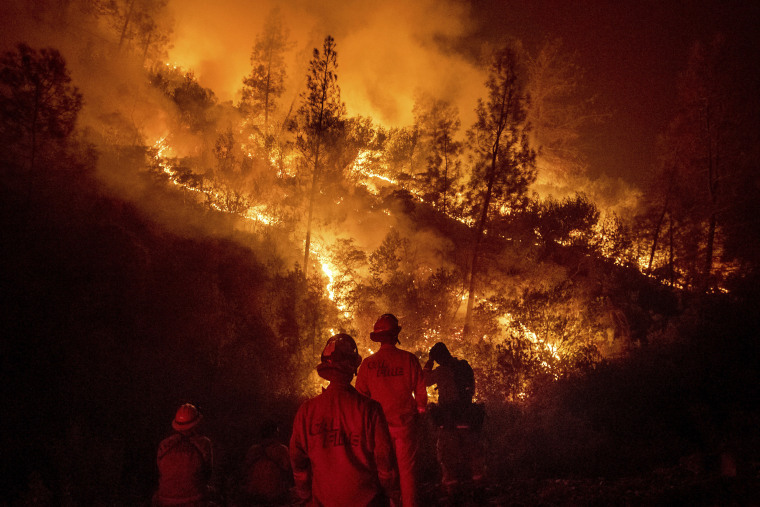 The effects of longer-term issues, including drought and climate change, still confront the nearly 14,000 firefighters working the fires statewide. "We're not out of the woods," Cox said. "It will take weeks to get full containment on some of these larger fires. A lot of difficult work lies ahead."